CHECHESMITHNATION : Wedding-Inspiration! Ex Beauty Queen Anna Ebiere Opted For This Off-The-Shoulders Number! Wedding-Inspiration! Ex Beauty Queen Anna Ebiere Opted For This Off-The-Shoulders Number! Ex beauty queen and Flavour's baby mama, attended a friend's wedding today, looking so soft and stylish in this navy blue off-the-shoulder floor-length dress...accessorized with a cute white face netted hat. You like? Yeah.....I like the white face netted hat. Adorable wedding party outfit! 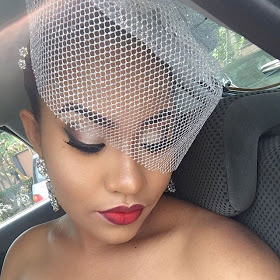 Really grateful to you for sharing these wonderful wedding guest dress inspirations. These dresses look perfect! I am going to attend my cousin’s wedding at one of prettiest wedding venues NYC​ and would like to have such a royal blue dress for the party.